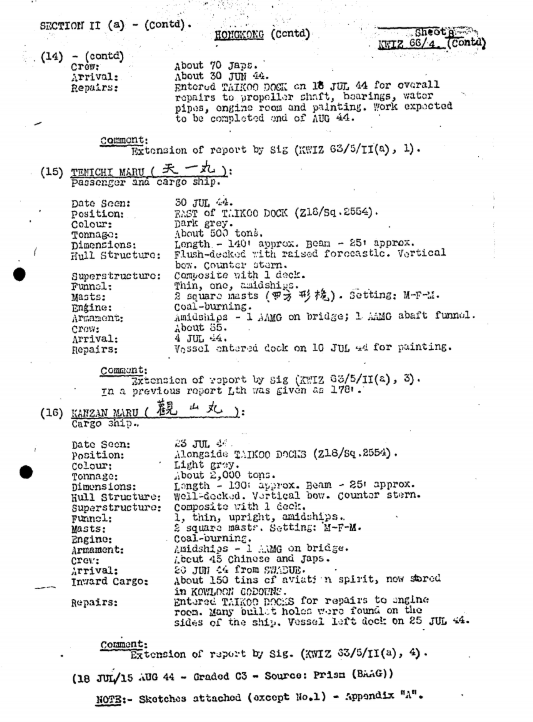 Elizabeth Ride has sent BAAG Report KWIZ #66 , dated 15th September 1944, and notes: After KWIZ #4, the Naval section is not included in the AWM papers, and does not appear again until KWIZ #66, and then in a slightly different format. 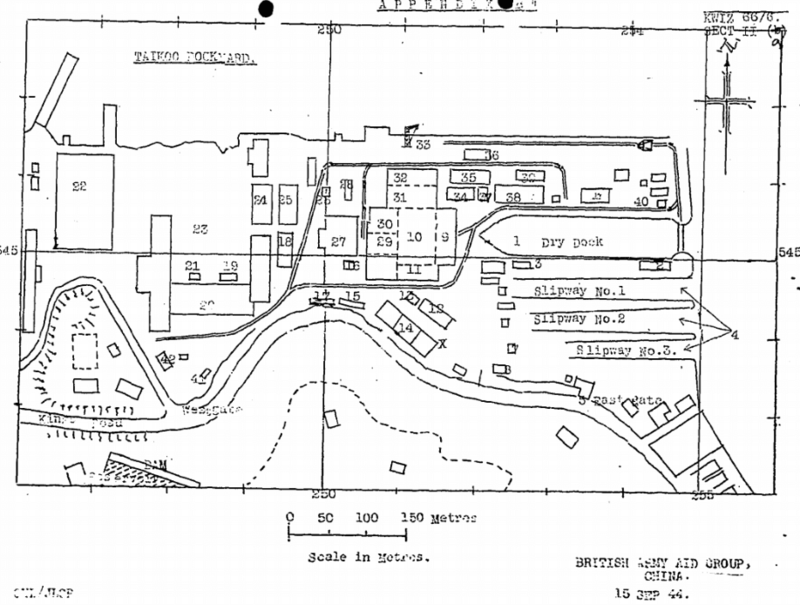 Elizabeth suggests that the ship sketches found towards the end of the report were probably intended as references for aerial/submarine recognition of features such as bow, stern and deck and positioning of masts and funnels. Can anyone confirm this or suggest other explanations as to why the sketches were undertaken? 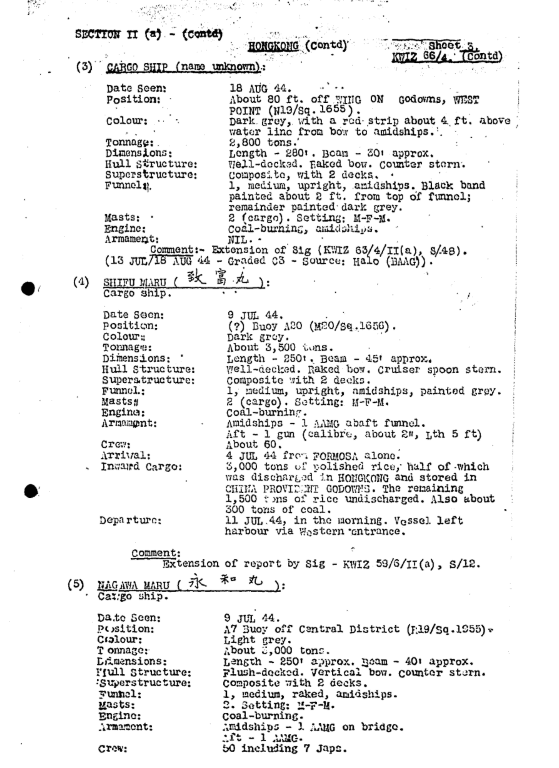 HF: I am afraid I am no longer able to summarize and list the most salient points in KWIZ reports as I did with the BAAG Naval Intelligence Reports, many of which are listed in our Index. HF: If you are able to provide images of vessels or locations mentioned in this report or information about subjects referred to which you think is relevant to our website I would be delighted to hear from you. 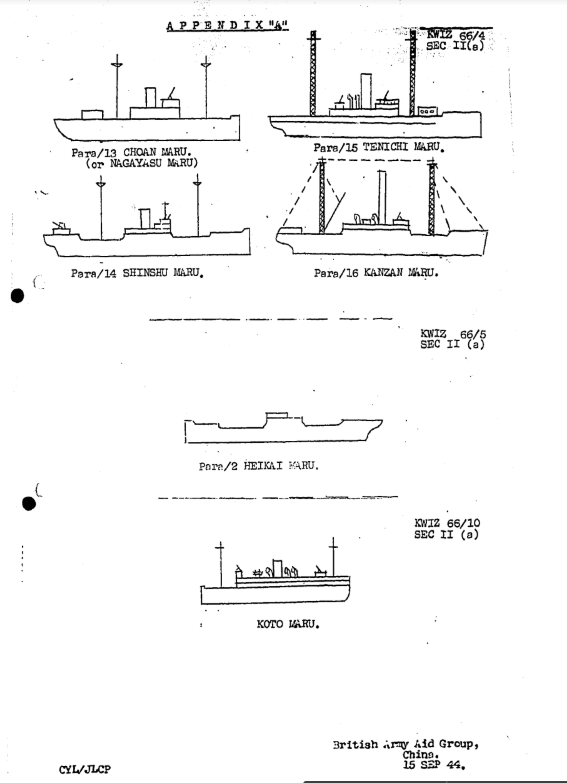 Please refer to Peter’s comment below this article for further information about the Chefoo Maru, which he believes is mistakenly identified as the Shifu Maru below in the report. 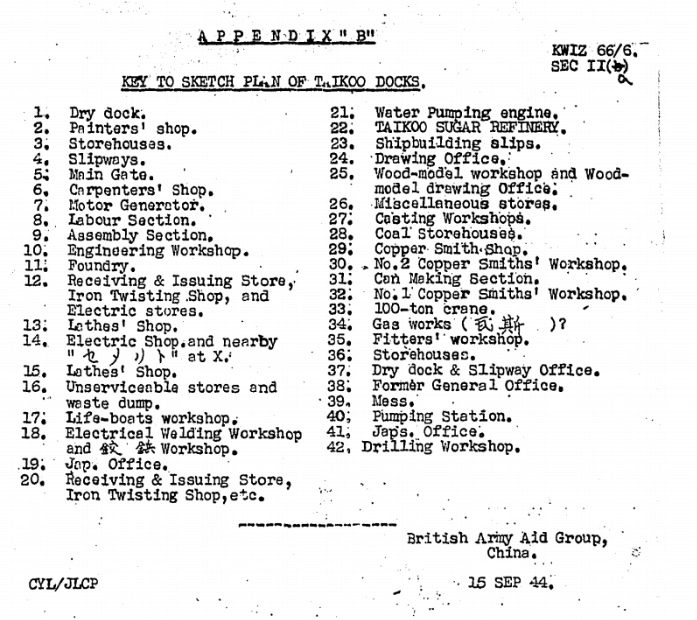 The British Army Aid Group (BAAG) was a military intelligence unit which operated in China between March 1942 and December 1945, originally as a branch of MI9. 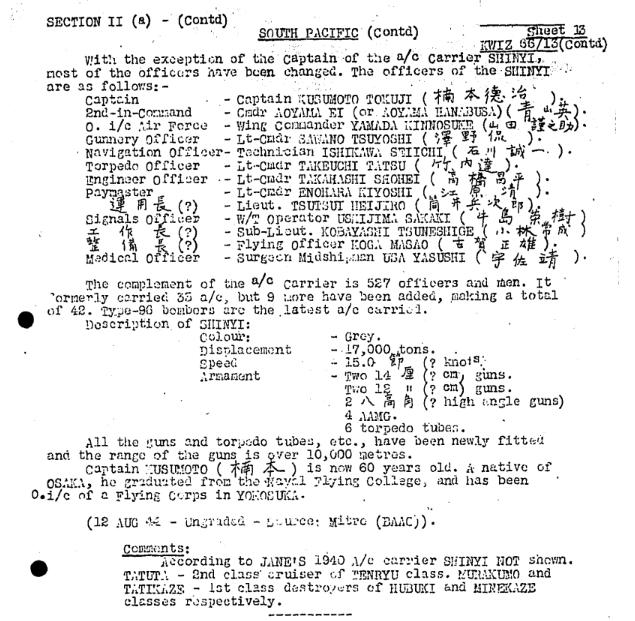 The officers were mainly European men with a Hongkong connection, and the operative agents were mostly local Hongkong men and women who offered their services, often at great risk, in occupied Hongkong and outside, in the fight for the restoration of their home and freedom. 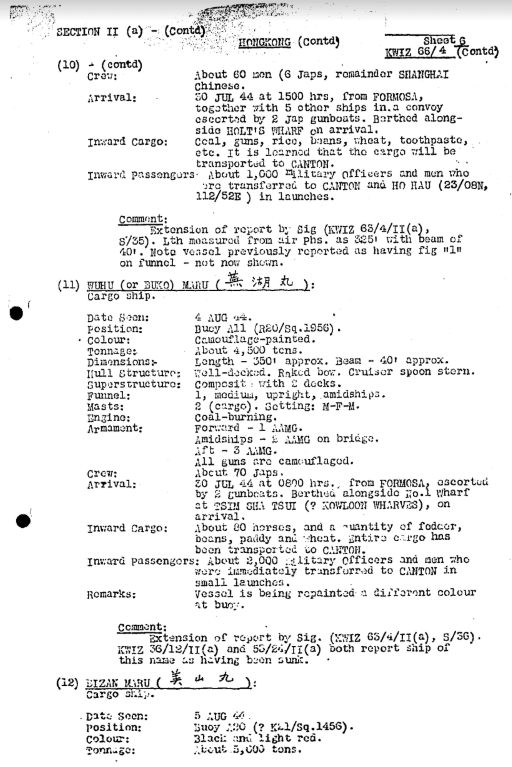 Throughout the the war the BAAG provided unique intelligence – military, political and economic – about conditions in both Hongkong and China; they also gave medical and humanitarian assistance to civilians and military alike, and eventually were able to play a part in the restoration of legal rule in Hongkong. 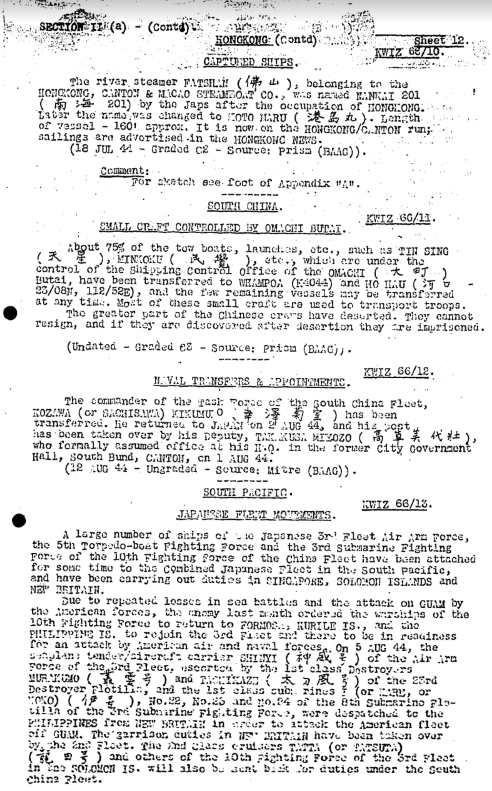 Our Index contains several examples of BAAG Naval Section Intelligence Summaries, other BAAG material plus many articles about Hong Kong during the Second World War. This article was first posted on xxxx xxxx. 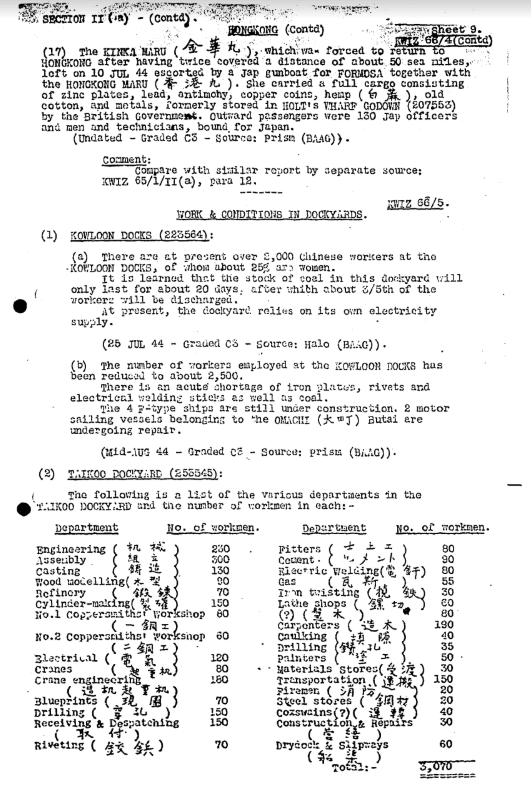 Our Index contains numerous examples of BAAG reports and extracts from them. This is the best yet with lots of new information. Dealing with the ships in the main-body of the text as numbered. 1/ Kensei Maru (not Shin Kensei) was ex Indo China’s Hinsang, seized Dec 1941. 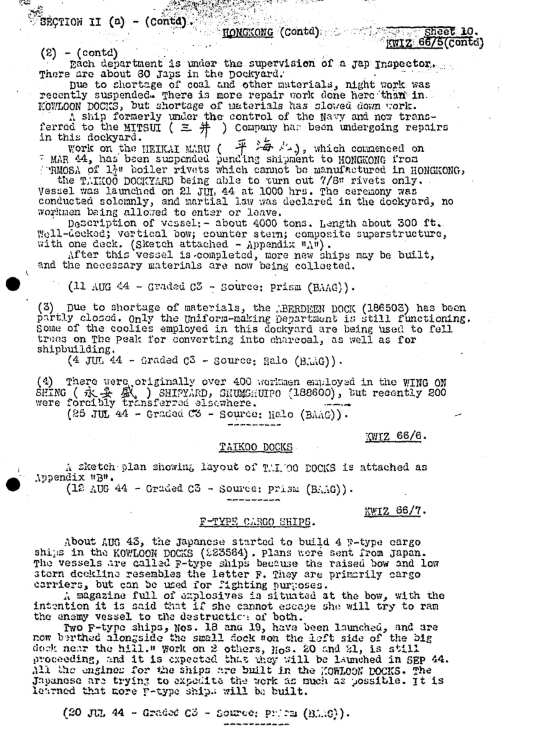 Unfortunately the statement the ship was in HK on 7 July 1944 is wrong. The ship was sailing to Singapore via Miri, Borneo in convoy MOMA-09 later MI-09. 2/ and 5/ Nagawa Maru appears a possible garble for Seiwa Maru 生和丸. There was a ship called Nagawa or rather correctly Eiwa Maru but this was not completed until Sep 1944 at Kobe,. But while Seiwa Maru is the closest the ship was in Singapore 30 June and could not have reached HK by 4 July. The identity remains unknown. 3/ Describes a standard C class ship and many possibilities. 4/ Shifu Maru evidently refers to Chefoo Maru. This ship was built by Hakodate Dockyard 3/43 and had a direct sister the Sainan Maru completed in June 1943. In addition a further 4 very similar ships were built by Mitsubishi Shanghai. The Chefoo and Sainan Marus were “based” out of HK, whereas the others were “based” out of Shanghai. The two ships maintained the HK-Saigon passenger, mail and cargo service for much of the war with occasional visits to Shanghai. Sainan Maru was mined and sunk 9/9/44 at Woosung Anchorage near Shanghai and Chefoo Maru was bombed and sunk 12/1/45 in the Saigon River. 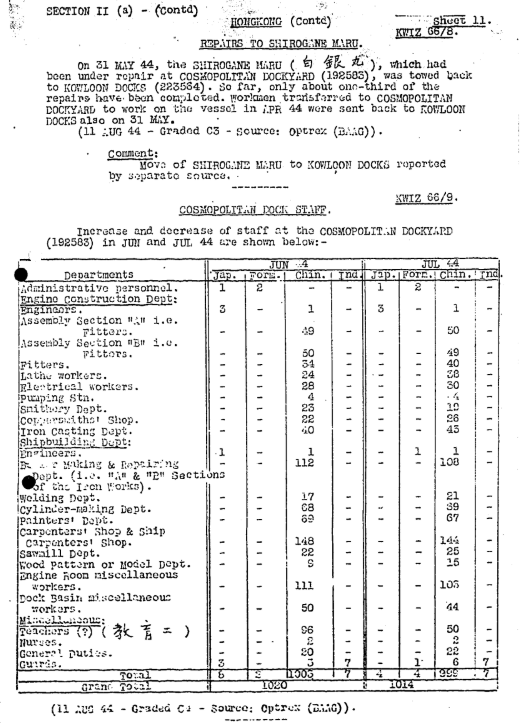 6/ Yulin Maru refers in this case to the smaller of two captured ships both renamed Yurin (Yulin) Maru. This ship was the former Norwegian steamer Herleik (1914 1893 gross tons) seized at Chinwangtao 8/12/41 while unloading coal. 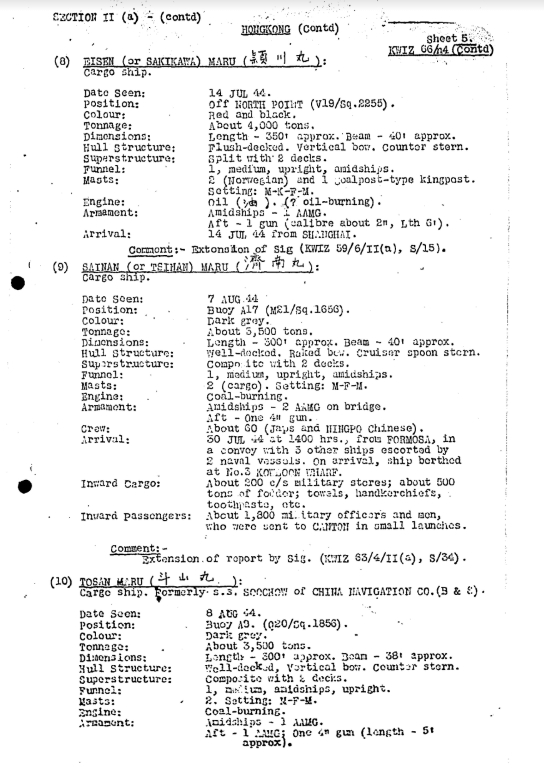 The ship appears to have operated between Yulin, Hainan Is and Tsakao, HK and Saigon and was lost by stranding 24/2/45 on the French Indo China coast N of Qui Nhon while on a voyage from Saigon to Yulin. 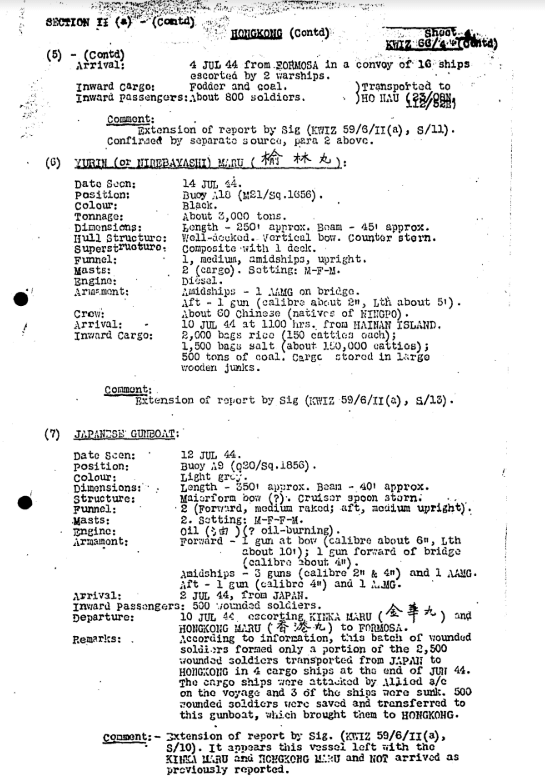 7/ The old destroyer Kuri escorted Kinka Maru and Hong Kong Maru to Takao and is presumably the vessel being referred to here. 8/ I think this is referring to Sagamigawa Maru although the first character of the name is not shown. The ship was known to be in the area and would fit. The issue is this ship (a 2AT design) was unusual with engines aft and bridge amidships, not matching very closely the drawing shown. The ship was also larger. 9/ Sainan Maru. See comment under 4 above. 10/ Tozan Maru is correctly identified. 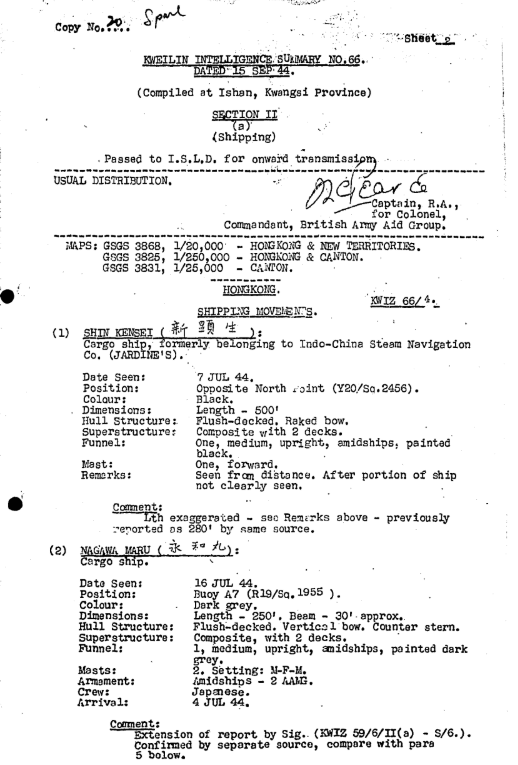 11/ Wuhu Maru is correctly identified. This ship was one of the 4 ships built by Mitsubishi Shanghai referred to in point 4 above. Buko (Wuhu) Maru was launched Oct 1942 and was 3222 tons. Her sisters were Chinko, Konei (Kiangning) and Kyuko (Kiukiang) Marus. A similar ship, Unzen Maru was built for NYK by Mitsubishi Yokohama. 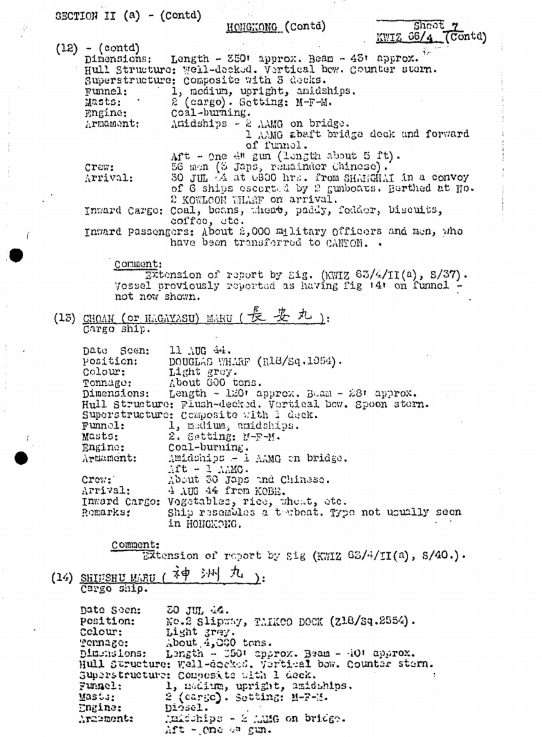 The Shanghai built ships were homeported in Shanghai and sailed as far south as Takao and Hong Kong normally..
12/ Bisan Maru is correctly identified and was ex British (Indo China SS Co) Ming Sang built 1934 3420 gross tons. The ship operated mostly between Japan and Formosa and Hong Kong and was mined and sunk 18/6/45 in the Kanmon Straits. 13/ Choan Maru was a small coaster that was used as a storeship. The ship was built in 1935 and was 330 gross tons and was sunk at Takao (Kaohsuing) 12/10/44 during the first series of US Naval air attacks. 14/ Shinshu Maru was a tanker built as a cargo ship in 1933 and 4182 tons and converted in early 1943. The ship had previously suffered an engine breakdown and limped into Hong Kong for repairs on 19 March 1944 where 4000 tons of oil had to be offloaded. 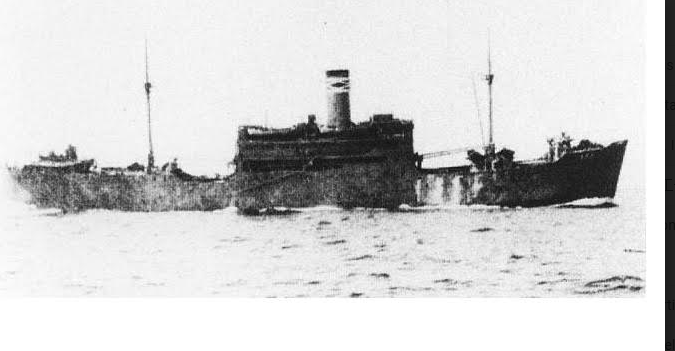 15/ Tenichi Maru was ex Tin Yat that was scuttled and seized at Hong Kong 25/12/41 with the ship being salvaged in 1942. The ship was built in 1932 and was 942 gross tons. The ship operated locally based out of Hong Kong and was bombed and sunk 18/2/45 south of Tourane (Da Nang), French Indo China. 16/ Kanzan Maru was ex Kwong Tung scuttled .at Hong Kong 25/12/41 and raised by the Japanese. Built 1904 and 1218 gross tons. The ship was sunk by air attack near Hong Kong 22/8/44 but was salvaged and afloat at war’s end. 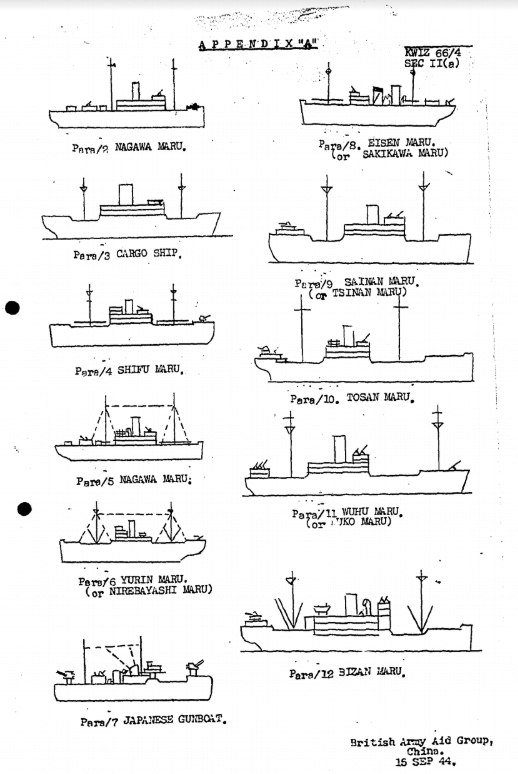 17/ Kinka Maru is correctly identified and was a large cargo liner built 1937 and 9305 gross tons..
As you can see from the above the accuracy of the agents in identifying ships correctly varied but was on the whole good.. .